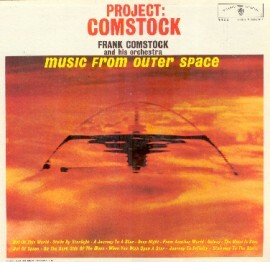 A marvel of sound and structure, this album evokes the music of the cosmos via revolutionary studio techniques, cinematic arrangements, and innovative electronic elements. Created in tandem with Paul Tanner (inventor of the electronic theremin) and electric violinist Elliott Fisher, Frank Comstock's arrangements subvert the very essence of conventional music. Traditional instruments coexist uneasily alongside electronic devices and effects to generate sound at its most deeply visual, conjuring both the vast beauty and ominous danger of the galaxy beyond earth's atmosphere.